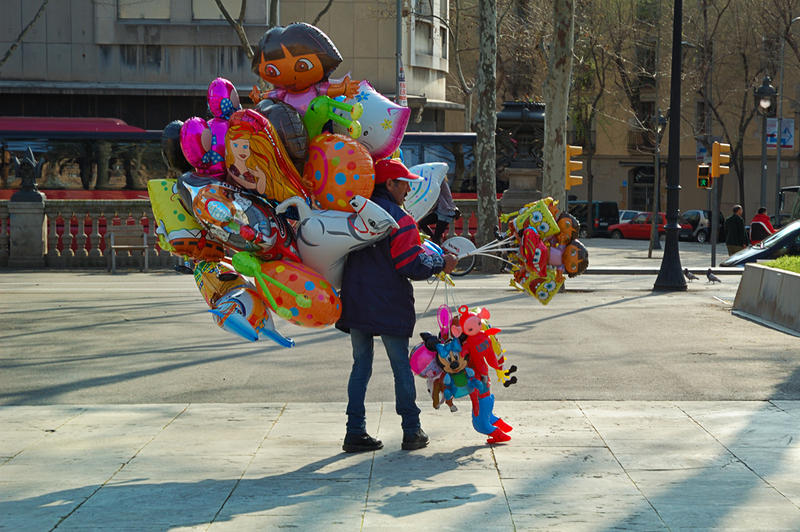 Selling balloons on the street is an occupation almost inherent to gypsies in Barcelona but this man and two other at Passeig de Lluis Companys, in the Arc de Triomf area, seemed to be Portuguese, maybe gypsies too, who knows. I suppose this activity is regulated but they always look worried and vigilant as if they were hiding from the police. To tell the truth balloons are a good treat for our eyes and if they make our kids happy, no matter how short a helium balloon's life can be, then what the heck, let them speculate a little bit. What is selling balloons compared to the subprime mortgages crisis?!! I love this image. And I love your commentary! I have news for that man: it is extremely difficult to hide from the police while carrying so many marvelous balloons! Great photo and even better commentary.